Violations reported in all three sectors. Over the past day, the Russian proxies 33 times breached the ceasefire in the zone of the antiterrorist operation in Donbas, the ATO press center reported 30 September on Facebook. In Luhansk sector, the silence mode was breached 12 times. Also, enemy drones were spotted in the area of Stanytsya Luhanska. "The enemy has launched armed provocations firing grenade launchers, machine guns and small arms in the areas of Novozvanivka, Novooleksandrivka and Popasna. Novooleksandrivka was shelled 82-mm mortars anti-aircraft systems," the report reads. Mariupol sector saw ten attacks - in the areas of Maryinka, Talakivka, Starohnativka, Shyrokyne and Pavlopil. 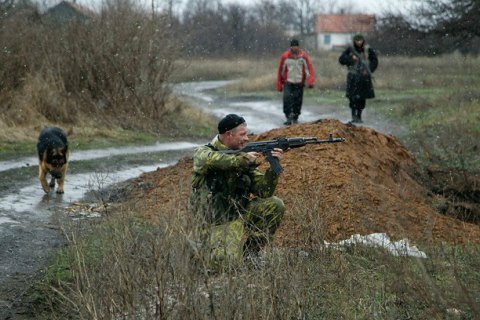 The terrorists used grenades, machine guns and small arms, and IFV-mounted weaponry in the area of Pavlopil. In Donetsk sector, the militants 11 times broke the silence mode. The fired grenade launchers, machine guns and small arms at the position of Ukrainian troops in Avdiyivka and Novhorodske. Avdiyivka was shelled from 82-mm mortars. An enemy sniper was active in the area of Verhnyotoretske. Previously, President Petro Poroshenko discussed the situation in Donbas with German Chancellor Angela Merkel.